Law students at The Sixth Form College, Solihull travelled to London this week to the Royal Courts of Justice and the Supreme Court. First year students went on the day trip to support their A level studies. The Royal Courts of Justice is an architecturally interesting building, which houses the High Court and the Court of Appeal. Some students watched a defamation case, while others were lucky enough to observe the challenge to the government’s right to start article 50 Brexit negotiations without Parliament’s authority. 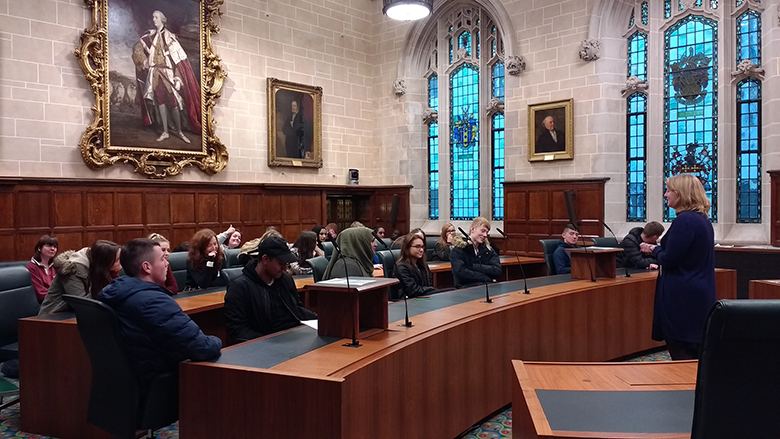 At the Supreme Court, the highest UK court, the students enjoyed a tour of the building and observed an appeal case in action. This visit follows hot on the heels of a competition that Year 12 students took part in to kick off their studies this year. As part of their introduction to Law, our Year 12 students were required to investigate the structure of the criminal court system in the UK, presenting their findings as a chart or diagram. All were then judged, looking for accuracy and creativity in presentation. The winner, Mehreen Ali, received a one-year subscription to the Law Review and a box of chocolates to enjoy.